When it comes to going fast, there’s always a few ways to do it. Obviously, European exotica is usually capable of stupendous velocity, but they often temper that ability with equally stupendous luxury and a price tag to match. Americans offer speed in abundance with an amazing ability to build horsepower, but that too has historically been mitigated by their questionable ability to deter from a straight line. So what is one to do? Well, if one has but a single car in this world, and that single care is the ability to cover any and every surface with starting ferocity, the choice is simple: buy a Mitsubishi Lancer Evolution. Although a relatively fresh face in this country, Mitsubishi’s fastest product has long been a favourite of overseas speed demons, earning more than its fare share of victories in the racing world and speeding infractions in the civilian sphere. 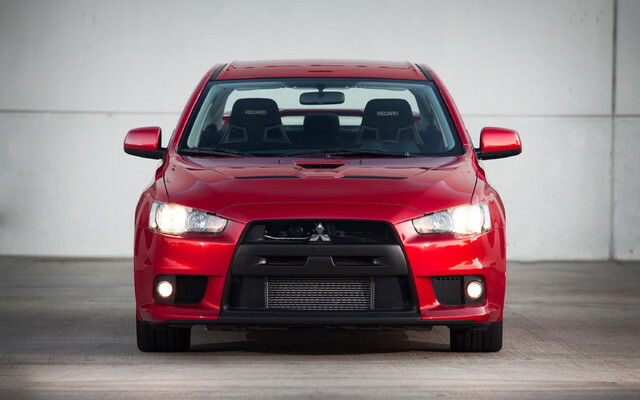 This, the 2011 Mitsubishi Lancer Evolution GSR, is the latest and greatest in a long line of sporting sedans that have leveraged the brand’s amazing all-wheel drive systems against an explosive turbocharged powerplant. And it doesn’t disappoint. Unless, of course, you care about such trivialities as interior noise levels and creature comforts, because if those concerns even pass through your brain for the slightest of seconds, keep looking. Although many vehicles boast similarly aggressive exteriors, none back up their fender flares’ promises quite like the Evolution. Step inside, and the firm, deeply sculpted Recaro seats will cast aside any lingering doubts that this is anything but a driver’s car. Based on the standard issue Lancer, the Evolution is shockingly spartan inside, its higher price tag automatically calling into question its lack of fancy trim, doodads and gizmos. Drawing the luxury line at power windows and locks, the $41,998 dollar Evolution is sparing, but with a cause: tipping the scales at just over 3,000 pounds, the basic Evolution is a relative lightweight. And when you hit that first turn, that light curb weight will definitely effect your perception of the Evolution far more than its lack of power seats will. First, there’s the mind-bending adhesion. Wearing some of the most aggressive tires ever fitted to a street car, the Evolution seems capable of defying physics when it comes to rounding bends, gripping the asphalt with a tenacity that would make a clingy girlfriend jealous. Hit a corner too quick, and all that grip keeps the ABS at bay regardless of how much pressure you place on the pedal. And then there is the acceleration. Although still endowed with that near-infamous Evo turbo lag, the top end rush is fantastic and engaging. From a standing start, the engine seems lacklustre at first as the combination of a relatively massive turbocharger and an unforgiving clutch take-up conspire to kill low-rpm launches. However, stretch your shifts into the upper reaches of the tachometer’s sweep and you’re rewarded with a nearly vertical powerband. Although listed as producing just shy of 300 horsepower, one would be forgiven for taking that figure as a baseline estimate. Capable of reaching 100 kilometres per hour in less than five seconds, the Evolution only begins to fall off in sixth gear, where the taller gearing demands more of the turbocharged mill. But it’s when you combine these three attributes; turning, braking and accelerating, that you truly begin to appreciate the Evo’s ability, and to be honest, it’s something that’s hard to put into words. Sure, there are faster cars out there, but it’s the Evolution’s accessibility and engagement that make it so charismatic. From the incessantly droning exhaust to the complete lack of creature comforts to the punishing ride, there are plenty of things to hate about a car like this, and yet you can’t help but love its honesty. This is performance motoring at its zenith, demanding as much of the driver as it provides. And it provides a lot. An amazing powerplant, one of, if not the best all-wheel drive system on the market, and brakes capable of displacing your teeth, the Evolution quite simple never comes up short: no matter what corner you round and what speed you round it at, you can’t help but feel as if you could’ve gone just a little bit faster. Just a few hundred metres of winding road is all it takes to erase the doubts instilled by hundreds of bland highway kilometres and re-affirm your faith that this is, without a doubt, one hell of a way to travel.